Tonight, I was putting Zi back to sleep, being pretty much tired from the weekend’s busyness. Instead of sleeping myself, I went online, and checked email, procrastinating sleep by the curiosity of our weekly financial summary statement by Mint. As I saw expected figures, I see something oddly unfamiliar, but something that made me ambivalently happy and sad. Encasing both emotions was the affirming realization of my husband’s love for me, and not just for our children since after Em’s and Zi’s birth, we’ve somewhat revolved our care for their upbringing, but Perze’s continued love for me from the beginning when it was just us. There was a separate category for savings, and despite its yet humble figure, it meant a lot for Perze to think of me and start building it. 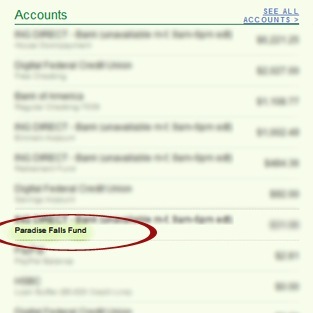 Completely unaware, yet drowsily humbled and appreciative, I read: Paradise Falls Fund. Obviously, one can infer why the thoughtful gesture would make me happy, but the thought of it also makes me a bit melancholic because I don’t really need to see Paradise Falls in my lifetime. I’m honestly and wonderfully happy and more than just content; I’m actually overwhelmingly thankful every day that I am where I want to be, despite what my husband make think I want in life, despite not having everything that glitters in this world. Paradise falls is where I reside with Perze and our two beautiful sassy daughters. Paradise falls is seeing my parents and siblings, and being loved by perze’s family. Paradise falls is serving in a church that isn’t perfect but strives to be a blessing inside and outside its doors. Paradise falls is sacrificing sleep three in the morning so my youngest can sleep instead. But thank you, Mahal. You always think of me. Five years married this coming June 19 makes five years of being in Paradise Falls.